I am trying to install numpy in python 3.5 under windows 10 with visual studio 2015 ultimate installed. Short version: file vcvarsall.bat is missing from vs14 folder C:\Program Files (x86)\Microsoft Visual Studio 14.0\VC folder. Why? Moving further with my research i learned out from: pip install gives error: Unable to find vcvarsall.bat that get_build_version() from $python_install_prefix/Lib/distutils/msvc9compiler.py returns the version of vs that shoud be used to find the path of vcvarsall.bat For me this method returns 14. So everything correct. Now when I look into the folder C:\Program Files (x86)\Microsoft Visual Studio 14.0\VC there file vcvarsall.bat is missing. But when I look into the folder C:\Program Files (x86)\Microsoft Visual Studio 12.0\VC there is a vcvarsall.bat. Why is vcvarsall.bat missing from vs 14.0 ?? 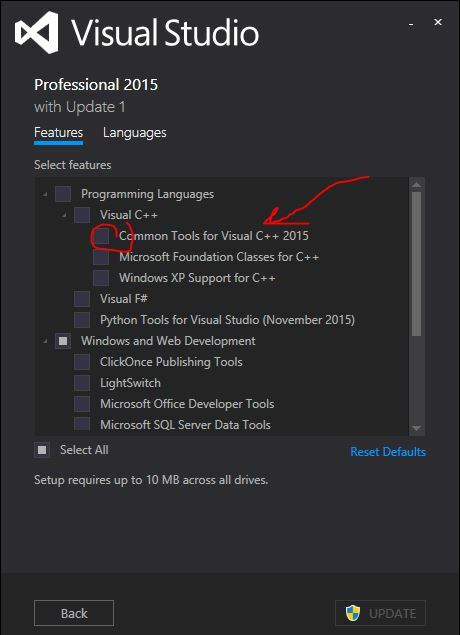 Make sure C++ Common Tools are installed in Visual Studio. I've come across this problem before when trying to install numpy. Although I was unable to fix the 'vcvarsall.bat' problem, I found that i could download pre compiled libraries from here: http://www.lfd.uci.edu/~gohlke/pythonlibs/ Download the libraries you want, navigate to wherever the downloaded .whl files are and open a command prompt window. run 'pip install [whl file name]' This will install the library for you with no compile issue. I downloaded the Microsoft Visual C++ build Tools Link Here and everything worked great. I met this problem when I was trying to build ujson package with python 2.7 (compiled with VS 2015). another problem is detecting VS version in function get_build_version() (distutils/msvc9compiler.py). You need to change this function to return right version of VS.
Microsoft Visual C++ 2008 SP1 Redistributable Package (x86, x64) Windows 8 and later require the Microsoft .NET Framework 3.5. See here for installation instructions. Disk Space Requirements : Installation requires 380 megabytes (MB) of hard disk space. Python Packages setuptools 6.0 or later is required for Python to automatically detect this compiler package. wheel is recommended for producing pre-built binary packages. Installing and Uninstalling The compiler package will default to installing just for the current user and does not require administrative privileges. To install for all users of a machine, execute msiexec /i ALLUSERS=1 from an elevated Command Prompt. Using with Python distribution tools Python package developers should download and use this compiler to produce binary wheels for their Python packages to upload to PyPI. Installing the wheel package, updating to setuptools 6.0 or later, and adding setup.py bdist_wheel upload to your build process will produce the correct files (remember to do this for both 32-bit and 64-bit versions). Install the package on your localhost. Install the required Python 2.7 module successfully without any errors. Not the answer you're looking for? 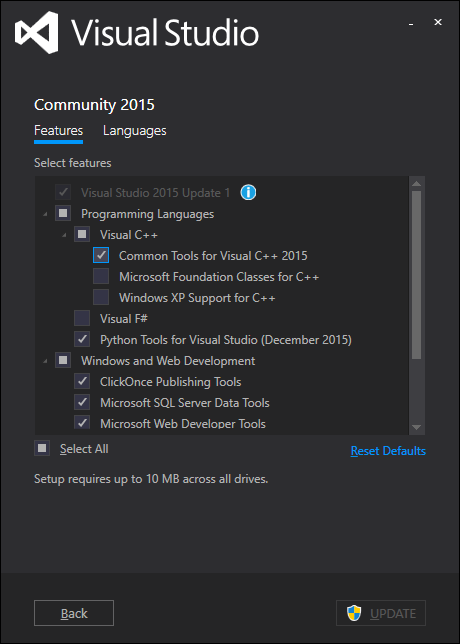 Browse other questions tagged python-3.x visual-c++ visual-studio-2015 pip python-2.x or ask your own question.